It was 10 years ago this month when we published this magazine. I noticed it on my office wall this morning during the steady onslaught of social media and text pings buzzing from my phone about Erik’s dramatic and historic win in the men’s super-G at the world championships in St. Moritz, Switzerland, sharing the podium with his long-time teammate Manuel Osborne-Paradis. This wasn’t the first time we had Erik Guay on the cover – certainly not the last – but times have seriously changed and a lot of water is under the bridge; not only for Mont Tremblant’s finest-ever skier and ski racer (Canada’s too) but also for the skiing industry and ski racing culture. Ten years is a long time and I feel fitting for a quick pause to reflect. 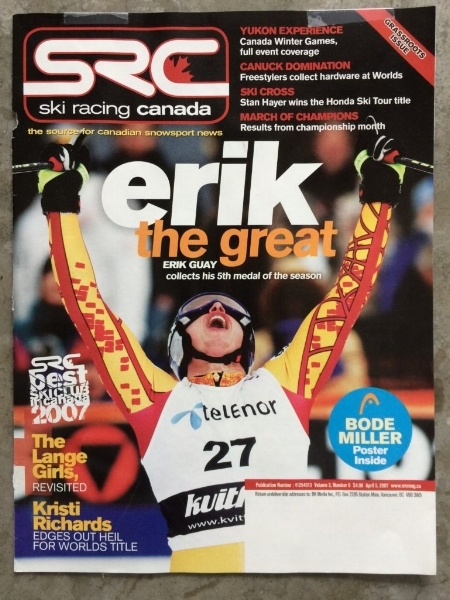 At the time of this Erik the Great cover story, we were pumping out a dozen print magazines a year, as Erik and his young teammates – the soon-to-be-dubbed Canadian Cowboys – were causing waves with the European ski fans, media and competitors by winning medals and respect and an even pace. And here he is today, wiser and hardened by years of physical, emotional and mental toil, standing on the top of the alpine world once again. Oh, and a side note, he got married, built a house and had three children in the meantime! Just 10 days ago Erik was exploding the social media-sphere after a gut-wrenching crash in Garmisch-Partenkirchen, Germany, where he luckily skied away with only minor bumps and bruises. Coming from a strong lineage of skiers and family that has embraced snowsports will full gusto, Erik has done everything with purpose and tact. He was five-years-old when he competed in his first ski race and, interestingly, his father Conrad (a legendary skier and coach in his own right) took Erik for a professional coaching course at age 12. Still today, they study video footage together, puzzling over the decisive fractions of a second to be saved. Erik has motored through his career with class and dignity, garnering respect from all those around him. When his career ends – with an A+ overall score – he will go down in the history books as the best Canadian ski racer of all time. For all the staticians out there, I just compiled a head count of the total top 10 finishes for Erik in world cup, world championships and Olympic games … 92. Yes, 92 top 10s (he’s been in the points 167 times). Part of that is a record 26 medals, two world championship gold medals and an overall discipline title. Oh, and BTW, the men’s downhill is on Saturday. Watch out world! Newer PostBOWLES’ BLOG: VONN VS STENMARK … THE RACE IS BACK ON! Older PostPRINT ISN’T DEAD. THERE I SAID IT.